Manny Pacquiao is a renowned Filipino professional boxer. He goes by several nicknames, the most popular being ‘Pacman’, ‘The Mexicutioner’ and ‘Destroyer’. The Filipino boxer is also an actor, semi-professional basketball player, singer, film producer and a politician serving as a senator in the Philippines. More to that, the man is a Lieutenant Colonel in the Reserve Force of the Philippine Army. Manny began boxing at the very young age of 14. He, however, started his professional career with a four-round fight against Edmund Ignacio, on 22nd January 1995, aged 16. He has over the years, maintained good form and remains without-a-doubt, one of the best ‘pound-for-pound’ boxers of all time, placing 4th in BoxRec’s global ranking. Despite his modest height of 1.69 m (5′ 6″) and weight of 65.317 kg (144lbs), Pacman is among the most resilient and entertaining boxers ever. To achieve this legendary boxing status, Manny Pacquiao has faced all kinds of boxers. He shocked the boxing world by flooring some boxing greats including the likes of Miguel Cotto, Shane Mosely, Juan Manuel Marquez, and Oscar De La Hoya. What makes him standout is his consistency and agility which sees him maintain his composure in the ring for the maximum twelve rounds. However, one of his biggest losses took place on the 6th of June 2012 when he lost to Timothy Bradley. This happened when he was at his peak and led to speculations that the fight may have been fixed. Following the loss, MP took a one-year hiatus from the ring. Manny Pacquiao has so far fought 68 matches, winning 59 (38 by knockout, 21 by decision), drawing 2 and losing 7. This is quite inspiring from a boxer who also holds the record for being the first and only boxer in the world to have held 7 titles from different weight classes. After his win against Timothy Bradley on 9th April 2016, Pacquiao picked the WBO International and Lineal Welterweight titles, becoming the only fighter in history to win the lineal championship in 5 five different weight divisions. Pacquiao is as well, the first ever boxer to win a major world title in four different weight classes – fly, feather, light and welterweight. With these major titles, Pacman became the only 8th division World Champion in the history of boxing – a feat the hit the Guinness Book of World Records! Pacquiao’s fight with celebrated American boxer, Floyd Mayweather, will go down in history as one of the most anticipated, most watched and highest-earning boxing match. The two boxers were initially supposed to fight on the 13th of March, 2010 but the bout never took off. Finally, they met on May 2nd, 2015 at Madison Square, Las Vegas. This fight was highly hyped all over the world. Although Pacquiao lost the match to Mayweather, he fought to the end. It was believed to be such a very narrow defeat that even Manny himself continued saying after the match that he thought he won! Manny Pacquiao’s success in the field of boxing has throughout his career placed him above his fellows and as well earned him prestigious awards. Between 2000 and 2011, Pacquiao was named the Fighter/Boxer of the Decade by three different boxing bodies – the BWAA, HBO, WBO and WBC. He was also named Fighter of the Year by the WBAA, The Ring and ESPN in 2006, 2008 and 2009. Pacquiao also topped The Ring‘s list of best pound-for-pound boxers in years 2008, 2009, 2010 and 2011. In 2016, Manny Pacquiao hit the 2nd position on ESPN‘s list of top “pound for pound” boxers in the last 25 years. According to BoxRec’s ratings, Pacman remains the best Asian boxer of all time. Nevertheless, having lost his last two fights, against Jeff Horn and Floyd Mayweather, Pacquiao’s boxing career seems to be in its dwindling phase. The great Filipino boxer will soon clock forty, and as expected, his stamina and prowess are significantly diminishing. Manny Pacquiao is indisputably one of the wealthiest athletes today. His earnings put him in the league of Tiger Woods, Roger Federer, Lebron James and many others. His fight with Miguel Cotto and Joshua Clottey earned him $35 million, catapulting him to the top of the list of wealthy athletes of the time. Forbes ranked Manny Pacquiao as the 8th most paid athlete in 2009 and 2010, with a total earning of $42 million. He continued going up the ladder, landing on #2 position in Forbe’s 2015 ranking. It is on record that Pacquiao has generated up to $19.2 million from pay-per-view buys, and has earned as much as $1.2 billion from his PPV bouts. Pacquiao’s Net Worth has been growing over time, reaching almost $200 million as of 2017. Despite losing to Floyd Mayweather in the famous 2015 fight, Manny is believed to have taken home between $130 and 150 million, a figure that no doubt swelled his net worth. Outside boxing, Pacman has sold two million copies of his music album, earns a salary as a Member of Parliament in the Philippines and has produced several movies. He has also earned from endorsements with brands such as Nike, Hennessy, Hewlett-Packard and Wonderful Pistachios. Unfortunately, some of the endorsements were cancelled when he took a year-long break after losing to Juan Manuel Marquez. But, his bout with Floyd Mayweather saw a handful of them return. Born Emmanuel Dapidran Pacquiao in Kibawe, Bukidnon, the Philippines on December 17, 1978, MP got married at the young age of 21. He married Maria Geraldine Jamora, also known as Jinkee, on 10th May 2000. Jinkee Jamora was born an identical twin with Janet Jamora, on January 12, 1979, in General, Santos City. Manny Pacquiao and Jinkee Jamora met in 1999, at the Filmark Mall, when Pacquiao came there with Jinkee’s uncle, Reynaldo Jamora, who was Manny’s personal assistant at the time. Jinkee who was not able to finish her Business Mangement Degree at the Notre Dame of Kiamba because of hard times was working as a beauty consultant at a cosmetic company in the mall to help her family. Reynaldo then introduced her niece to Manny Pacquiao and it appeared the Pacman immediately fell in love as he continued coming back to buy beauty products he never needed – all in the bid to catch a glimpse of Jinkee. He eventually asked her out in one of the visits, and although Manny was already engaged before meeting Jinkee, he called it off and the two got married civilly only seven months later. They later did their church wedding in 2001. Manny Pacquiao’s wife is a businesswoman, former politician and Vice Governor of Sarangani Province, in the Mindanao Island of the Philippines. She ran for the post with the ticket of the United Nationalist Alliance in 2013 and won. Jinkee said she was inspired to join politics because of the Bible’s injunction to love one another. She, however, decided to quit active politics after serving only a term (2013-2016) in order to pay more attention to her family as well as the Pacquiao’s chains of businesses. It is worth noting at this point, that the first decade of Manny and Jinkee’s union was characterized by instability and fraught with rumours of gambling and infidelity on the part of Pacquiao. The couple, however, continued patching things up until the 11th year when they decided to embrace God and His word – the Bible. They also sought to be counselled. From there, they were able to transform their relationship and home into a stronger, more united and happier one. The Pacquiao’s who are now devout and practising Christians, live together in General Santos City, Cotabato del Sur, Philippines. 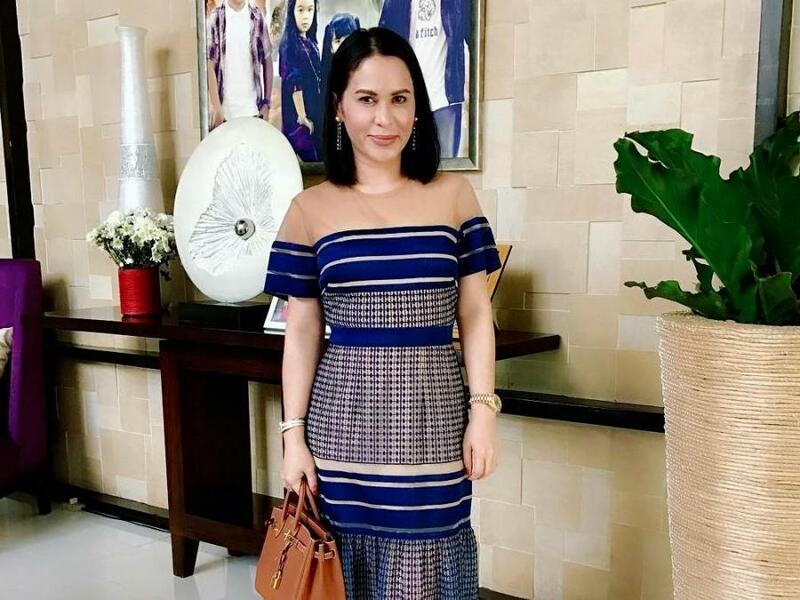 Manny and Jinkee Pacquiao have five kids – Emmanuel Jr., Michael, Mary, Queen and Israel. But Pacquiao’s children are not quite interested in boxing as a career. Jinkee once disclosed in an interview with TV5 that none of their five kids is aspiring to step into their father’s ranks. First son, Emmanuel Jr. Pacquiao aka Jimuel who was born in 2000, has chosen to be a model. He got his first modelling endorsement in May 2016. The second, Micheal Stephen Pacquiao, born on 12th December 2001, appears to be going the music direction since he is already a skilled pianist. Manny and Jinkee’s first daughter, Mary Divine Grace Pacquiao was born in 2006 and is affectionately called Princess. The second girl, Queen Elizabeth Pacquiao, was born in December 2008 in Los Angeles, USA. She is the only child of Manny Pacquiao that was not born in the Philippines. Another spectacular thing about this child of The Mexicutioner was that he witnessed her birth, being the one that cut her umbilical cord. Little wonder she was named Queen Elizabeth. The last man, Israel Pacquiao arrived on the 27th of April, 2014, 3 years after Manny and Jinkee fixed their home the godly way. His parents’ renewed devotion to the Christian Faith was exactly what inspired his name Israel, the Holy Land of Christians.